It's mildly annoying that this Minimate is wearing the same costume as the last one, but it's done so much better that it's hard to complain about. Rather than a plain black body, he has grey musculature, and the detail on his chest-circles is much more crisp. His mask is removable (leaving him with civilian hair), so the three white bars that make up his headdress are not just glued onto a normal head. I've gotta say, the old head was better. Good thing the Minimate construction means you can swap parts easily! When Ororo Munroe first met Charles Xavier, she was a pickpocket on the streets of Cairo; when next they met, she was a weather-controlling goddess on the plains of Africa. Recognizing the potential of her mutant abilities, Xavier asked her to join his mutant strike force, the X-Men. Remember in the review for '90s Storm when we said there was a debate about what color that costume was meant to be? It was because she was wearing this costume immediately prior. 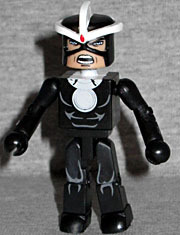 They're cut nearly identically, and this one was drawn as black with white highlights, while that one was drawn as white with black shadows, making for a minimal change at best (and it didn't help that the old ToyBiz X-Men line used the same mold for both costumes, just painting them differently). 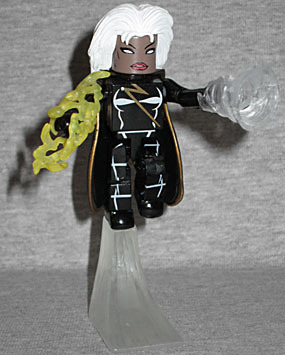 This Minimate is gloss black, with gray details, gold trim on the cape, and a big gold lightning bolt on her chest (which, as a new comicbook reader back then, I always got confused with Ms. Marvel's costume). She has big new hair, painted earrings, a swooshing fight stand, two lightning effects for her arms, and also a new miniature whirlwind piece that can fit over her hand. That's neat! This is an interesting set. Like many of the TRU exclusives, it's meant to complement another release (in this case, Marvel Minimates Series 47), but in some areas it actually came out about a week before those figures. How odd! This entry was posted in Art Asylum, MMMR and tagged Captain America, Iron Man, Minimates, Spider-Man, X-Men. Bookmark the permalink.